White-tailed deer (Odocoileus virginianus) provide abundant recreation opportunities for hunters and wildlife watchers. Unfortunately, they can also cost us millions of dollars every year. How? Imagine you are driving down a poorly lit road at night when all of the sudden a deer appears on the road in front of you. Despite your honking and screeching breaks, the animal remains frozen in its tracks, exhibiting to perfection 'a deer in headlights'. Deer vehicle collisions are incredibly dangerous and often costly. So listen up motorists, now is the time when deer are on the move and extra caution is advised when out on the roadways. So what is happening during October and especially November that increases the chances of Ohio motorists colliding with deer? Some people may think that hunting causes an increase in deer movement, particularly across roads and highways (Ohio’s deer hunting season runs from Sept. 24 – Jan. 10), but this isn’t always the case. For example, movements of antlered deer in Pennsylvania wearing GPS radio collars were tracked during the weeks before, during, and after muzzleloader and firearms seasons and there were no changes in activity patterns due to the hunting season. Deer movement due to hunting depends on the amount of hunting pressure, and while intense pressure can cause an increase in deer activity, typically deer stay within their normal home ranges. The truth is, deer are on the move at this time of year for multiple reasons, both natural and human related. Possibly the biggest reason for the increase in deer movement is the breeding season (rut), which takes place October through December in Ohio. In November, deer are entering the peak of their breeding season. Males are actively searching for mates which frequently bring them across roadways. The total distance a single deer moves during a 24-hour period varies from 1 – 4 miles, but that distance is increased dramatically in males during the breeding season. While some female deer may take a brief breeding excursion outside their normal range in search of a mate, the majority stay put and don’t travel more than normal during the breeding season. Yet another factor that can contribute to increased deer movements, is food availability. This time of year deer need to increase their food consumption in preparation for winter. Depending on the available food resources in their home range (such as acorns and other hard mast), deer may have to travel further to find enough food, which can lead to additional travel across roadways to reach alternate resources. The Ohio Department of Natural Resources, Division of Wildlife reported a small increase in white and red oak acorn production this year, however production is still below average. It's important to realize that acorn production, as well as other hard mast such as hickory nuts and walnuts, is cyclical. Some years will produce higher crops than others. Source: ODNR, Division of Wildlife 2016 Acorn Mast Survey Results. Daylight savings time also plays a role in motorists encountering deer on the roadways. As Ohioans “fall back” (on November 6th this year), the shorter days and longer nights force commuters onto the roads at dawn and dusk - the same times deer are most active. Also, motorists shouldn't make the mistake in thinking that deer will only be encountered crossing roads in rural parts of the state. In fact, urban and suburban areas are also prime sites for deer vehicle collisions. To summarize, October through November is the prime time for deer vehicle collisions. Deer are sighted frequently during this time for a variety of reasons; breeding season, hunter avoidance, increasing deer populations, and lessening of daylight hours. What can drivers around Ohio do to remain safe and decrease their chances of an accident? Take special precautions this time of year to avoid collisions, especially at dawn and after sunset, and during the hours of 5 p.m. – 1 a.m. and 5 a.m. – 8 a.m. Be extra careful throughout November, as the number of accidents peak during this month. Remember that breeding season for deer is October – December, and although most accidents occur in October and November, remain vigilant through December. Often times when there is one deer, there are more. If one deer crosses the road, slow down because there may be more on their way across. If a deer runs in front of your vehicle, brake firmly but try not to swerve. Swerving can cause the loss of control of your vehicle, which can lead to more damage to you and your car. The Ohio State Highway Patrol reports that more people are injured trying to avoid hitting a deer than those that don’t. Pay special attention to deer crossing signs. 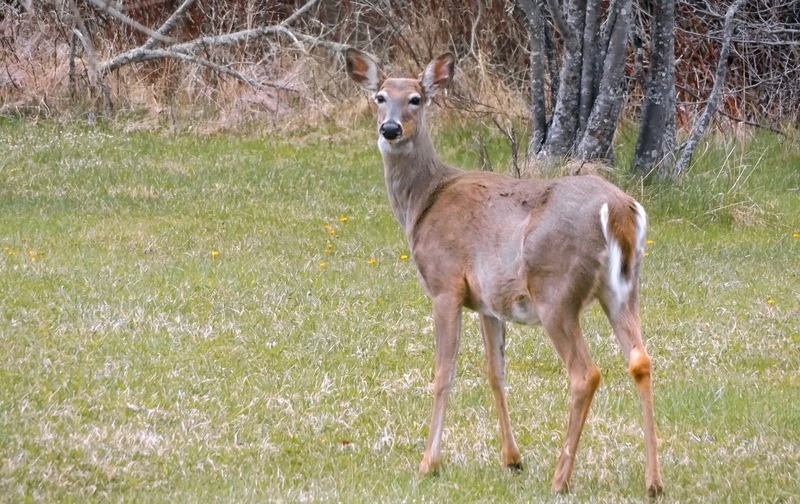 They are there for a reason – to alert you of a high deer density area. Stay alert and constantly on watch especially during the dawn and dusk hours and on dark roadways. Deer can be very unpredictable, especially when frightened. If you pass a deer on the road side, flash your lights at oncoming traffic to alert the other drivers of potential danger – a little warning can go a long way in avoiding an accident. Perhaps you have heard of the hood-mounted deer whistles and ultrasonic devices designed to scare away deer? Skip the purchase - wildlife biologists have found no evidence these devices work. Finally, and possibly most important - because a deer-vehicle collision cannot always be avoided no matter how vigilant you are – wear your seat belt. Luckily, most deer vehicle collisions don’t results in human fatalities; however the number of crash deaths is increasing in almost every state, including Ohio, which is one of the top 5 states with the highest fatalities. In a study completed by the Highway Loss Data Institute, 60% of the people killed in an animal collision accident were not wearing their seat belts. So be sure to buckle up. Be safe on the roads this fall season! For more information about this past season’s deer harvest, projections on this year’s hunting season, and results from the 2015 hunter survey, check out the ODNR, Division of Wildlife's Ohio Deer Summary.